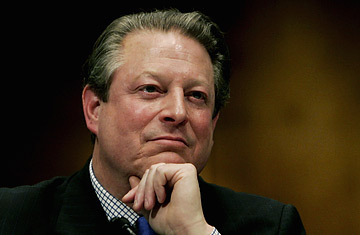 Al Gore was busy polishing his Nobel acceptance speech when TIME recently visited him. Before Gore jetted off for Oslo, we asked him about the state of the planet, his growing celebrity and whether he ever plans to fill that one blank line on his résumé. Take us back to the moment when you won the Nobel Peace Prize. What did it feel like to get that call? Actually, I didn't get a call. My staff was informed that in the event the committee had selected me, I would receive a phone call 15 minutes before the global press conference. My wife Tipper and I were in California at the time, and we stayed up until 1:45 a.m. I have to admit, I looked at the telephone when it didn't ring. A few minutes [before the announcement at 2 a.m.,] I said, "Let's turn on the TV and see who did win." The chairman was speaking Norwegian, and my wife  perhaps because of her Swedish heritage  heard something I didn't, turned to me and said, "You won!" Do you view the prize as a personal vindication, given the criticism you've received in the past? I have honestly not put it into that context at all. My focus is on continuing to galvanize a global response. It's the greatest honor I could ever have, but it's hard to celebrate recognition of an effort that has thus far failed. I'm not finished, but thus far, I have failed. We have all failed. Why use the word failed? Today we're dumping 70 million tons of global-warming pollution into the environment, and tomorrow we will dump more, and there is no effective worldwide response. Until we start sharply reducing global-warming pollution, I will feel that I have failed. There is no precedent for the mobilization required. The closest examples are when nations mobilize for war. So you would argue that this crisis is on par with World War II or the Great Depression? The north polar ice cap, according to the best scientists in the world, fell off a cliff this fall. The signs that the world is spinning out of kilter are increasingly difficult to misinterpret. The question is how to convince enough people to join a critical mass of urgent opinion, in the U.S. and the rest of the world. Why hasn't that message been fully received yet? I spend a lot of time asking myself that question. I think we're making progress; it's just that nothing has matched the scale of the response that is truly needed. The unprecedented nature of this crisis does make it difficult to communicate. We naturally tend to confuse the unprecedented with the improbable. But we have become capable of doing catastrophic damage without realizing it. We've quadrupled population in less than a century, amplified the power of technology many thousands of times over, and we haven't matched those changes with a shift in our thinking that lets us take into account the long-term consequences of our actions.